Exists a method or environment to write in French, exactly like a quote in « guillemets », a text in — en dashes — with automatic non-breaking spaces inside ? 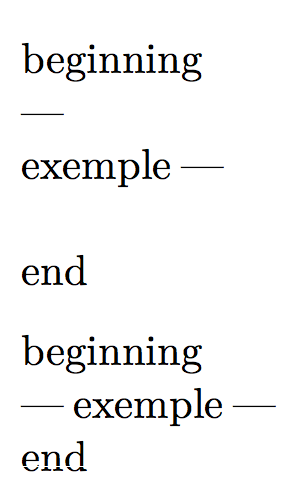 So, I used this trivial method, but it cut between dash & exemple inside at line break : beginning —~exemple~— end. You can define \dashquote which works in pairs. First (and each odd) occurrence of the \dashquote works like --~ and second (and each even) occurrence of the \dashqoute works like ~--. And finally, you can set (in XeTeX) the unicoded character — as an active character and define it as \dashquote. Text — quoted example — text. % Works like: Text --~quoted example~-- text. Text —quoted example— text. % Works the same, like: Text --~quoted example~-- text. In the example the \parbox is just to force LaTeX to break as much as possible. The third \parbox contains the — character that is equivalent to typing \textemdash. The problem with --- is that TeX adds an empty discretionary after a hyphen - or any ligature that ends with it. Is this —what you mean— in the question? Not the answer you're looking for? Browse other questions tagged punctuation french or ask your own question. Why are my en-dashes and em-dashes light gray?